Last week we saw Ringo Starr & his All Starr Band at a small (1,800 seat) theater in New Jersey. Ringo has toured every couple years with his All Starr Band; in his words "everybody on stage is a star in their own right." The band plays together throughout the concert, with each of the members doing some of their own hits in between the Ringo songs. The members of the Band have changed with each tour, though there have been a few performers, like Edgar Winter, who have been included on a number of tours. The short review is this - Ringo Starr is a very amiable guy who obviously likes to interact with the audience, and the audience seems to love him. He performs his own songs well, and he does justice to the Beatles numbers he performs - he’s a pleasure to watch. The All Star Band, notably Edgar Winter and Rick Derringer, are incredible musicians. Edgar Winter remains one of the most amazing musical performers ever, and Rick Derringer (with who I was unfamiliar before this concert) is among the great rock guitarists. If you’re looking for 2 hours of solid entertainment, then don’t miss Ringo Starr and his All Starr Band if they come your way - after all, how often do you get to see a genuine Beatle, and considering Ringo was turning 70 the day after we saw him, how long do you think you’ll get that chance? And the detailed review . . . .
And first let me say, I have always been a Beatles fan. I was in 8th grade when they hit our shores and, like all my friends, I grew Beatle hair, got Beatle boots and bellbottoms (but somehow the girls weren’t running screaming after me and my friends like they were after Paul and John). So I was a Beatle fan, but not necessarily a Ringo fan. To say I was a little surprised when Ringo came onstage is an understatement. The crowd (including me) jumped to their feet for the longest, loudest, standing ovation I have ever witnessed – and he hadn’t even played one number! I guess Beatlemania endures all these years later. He opened with “It Don’t Come Easy”, standing at the front of the stage with a mike, and it was readily apparent that he actually could sing these numbers live, and was having a good time doing it. It was a little strange seeing Ringo as the frontman for the band – but he performed about half his numbers that way, and the other half from behind his drum kit. He did a great job with the “Ringo songs” – “It Don’t Come Easy”, “Act Naturally”, “Photograph” and some songs off his recent album “Y Not” which were, incidentally, very good. But as you can imagine, the audience just went nuts when he did Beatle songs - “Yellow Submarine”, “I Wanna Be Your Man”, etc. He finished the concert with a medley of “A Little Help From My Friends” which morphed into “Give Peace A Chance”. Ringo was thoroughly entertaining and engaging. He looks good, seems to be in great shape, and was having a fun time himself. I really enjoyed his parts of the concert (much more than I thought I would). Edgar Winter . . .
Whoa. This guy’s the real deal. At the Harley factory in Milwaukee they say “If you cut him, he bleeds black & orange” to describe a person who's a Harley guy through and through . . . and I’m pretty sure if you cut Edgar Winter, he would bleed notes and chords. I saw him open for the Allman Brothers 40 years ago, and he literally stole the show. And he hasn’t lost anything. He played keyboards, synthesizer and sax for Ringo and all the others, and did an amazing job. He performed two of his own numbers, Free Ride and Frankenstein, but those alone were worth the price of admission. Maybe you’ve never seen him perform Frankenstein - - he plays the synthesizer, then jumps on the sax, and the drums - - he’s all over the stage like a man on fire playing instruments as well as the best you’ve ever heard. And his ability to play synthesizer and keyboards live is unmatched by anyone. I came away feeling like I did 40 years ago – thinking I had seen the most talented musical performer alive. Or at least the most talented musical performer I’ve ever seen. Rick Derringer . . .
OK, I’ll admit I didn’t know who he was, at least by name. He was the lead singer and guitarist for The McCoys, who did “Hang On Sloopy” back in the day, then he went on to a solo career which included hits like “Rock and Roll, Hoochie Koo”. He did a great job with his hits, but what got me was . . . . I’ve seen a lot of people over the years play hard rock guitar, and many many who try to play like Jimi Hendrix, but somehow they always sound like they’re “trying” to play like Hendrix. Well, this is another guy who’s the real deal . . . if you closed your eyes during his guitar solos you would have sworn you were listening to Hendrix. Wally Palmar . . . I was also unfamiliar with him . . . he was the lead singer for the 80’s group The Romantics. He did a great job on guitar throughout the concert, and has the kind of likable personality that lets him get the crowd going. He had the crowd on it’s feet and singing to The Romantics big hit “What I Like About You”. Gary Wright . . . He wrote and sang “Dream Weaver” in 1976. And he told us this interesting story of how he was in India with George Harrison (yeah sure, exactly how many people were with the Beatles in India??!! – but since Ringo was sitting there listening, I think we can assume it’s true), and how he and George were studying with some maharishi, or bhagwan, or yogi, and in his notes about the topic wrote the words, “dream weaver”, which led to . . . Anyway, he did a great job performing the song (which was clearly enhanced by the participation of Edgar Winter, who was able to perform all the sort of psychedelic keyboard stuff flawlessly). He also played keyboards throughout the concert, but was obscured from view behind speakers, and was even more obscured by the presence of Winter on keyboards and synthesizer. Richard Page . . .
Also unfamiliar with him . . . he was the lead vocalist for the late 80’s group Mr. Mister, whose big hits were “Broken Wings” and “Kyrie”. Page did a great job on guitar, and on his songs . . . but his songs seemed a little out of context in such a high energy upbeat setlist. Greg Bissonette . . .
Professional drummer. Mirrors everything Ringo does on drums, except when Ringo is at the front of the stage singing into the mike, which is of course why Bissonette is there. The crowd . . . It was a good crowd, who loved Ringo, and also loved Edgar. Interestingly, the crowd was older than you would see at a McCartney concert, where you always seem to see little kids – there were no little kids here. (Maybe because it was a small theater and pricey?). This is not to say it was all old farts like me – Rashmika was, coincidentally, born the very month the Beatles released their first top twenty hit, “Love Me Do”, and she was still a little kid when the Beatles broke up, and she was clapping and singing Yellow Submarine along with Ringo! One of the most entertaining concerts I’ve ever been to and I will absolutely see the All Starr Band again if they ever come back this way. We had a great time at "Pink Floyd Experience"
We saw them last night at Princeton. And did I mention, these guys are great musicians, and can deliver flawlessly. Rashmika and I have seen Roger Waters and David Gilmour, and while the PFE can't deliver the intangibles (like Waters' "presence"), they can deliver the music - and since the opportunity to ever see Pink Floyd together again is nil, and I suppose the opportunities to see Waters or Gilmour diminishes as they age . . . . So if they ever come your way, and you want to hear someone someone perform "Another Brick in the Wall", "Wish You Were Here", "Dark Side of the Moon", or any of the other great songs the same way you would get them from Pink Floyd, buy a ticket. We really enjoyed their show. More info at the Pink Floyd Experience web site. A few weeks back I posted a poll to determine who is America's Greatest Rock Star. SECOND, my (sad) conclusion. 13 people voted, but 2 voted for "rock is dead" - so really 11 people voted, not exactly overwhelming. I would say, "apathetic". It has been pointed out to me that the mainstream of people who listen to music are not listening to rock and roll any more, much as I was not listening to Frank Sinatra or Tony Bennett in the 50's, 60's, 70's. I have been told that the mass of younger people are listening to Jay-Z, Eminem and other stars who are not rock and rollers. So my second conclusion is, sadly, that I (and many of my friends) have reached that same place that my parents were in when I simply couldn't understand that they didn't "get it". This is not to say that people, including young people, don't listen to r&r - it's just that r&r is no longer the mainstream music that expresses the aspirations, feelings and desires of the future of our society . . . the youth. As this was a poll of American rock stars we didn't include Paul McCartney, U2, Elton John, David Bowie, etc., etc., etc. There are currently many more major British rockers than there are Americans, but it really doesn't change the result. R&R is taking it's place on the shelf next to the crooners of bygone days. You can be sure the great R&R music will survive, but I'm afraid the days of girls screaming over Elvis, dancing in bars to the Rolling Stones' Honky Tonk Women and marching for righteous causes to the music of Bob Dylan are long gone, and don't reside anywhere in the memories of our youth. PS: I will now go turn on my 70's era monster stereo, 500W per channel, and listen to the incomparable drum solo from In-A-Gadda-Da-Vida, and rock will continue to live on here in my world. So far, Bruce has 3 more votes than is showing above (3 people, who are not LJ users and could not vote, emailed me to say if they could vote, it would be for Springsteen). 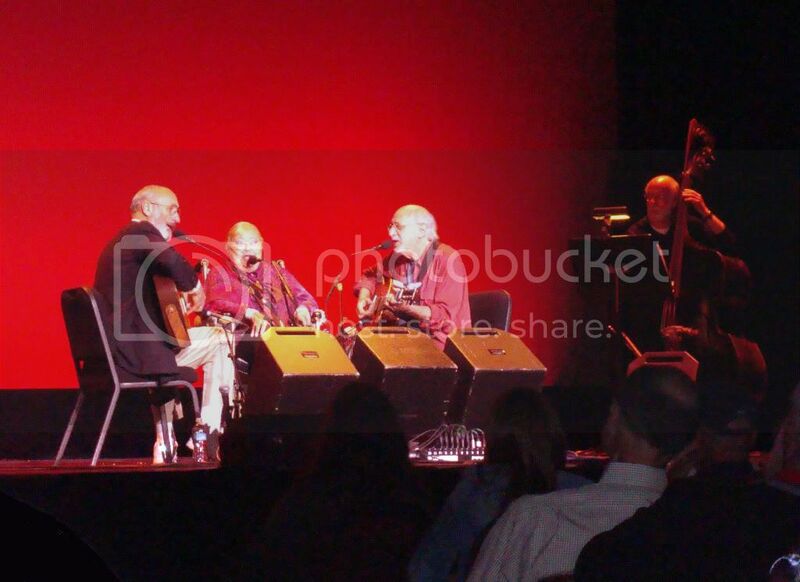 We were lucky to catch Peter Paul & Mary at the State Theater last night. I first remember them from my teens, when they were leading the Peace March in Washington, and they were marching with Dr. King - and their songs like "Blowin" In The Wind" were essentially the musical soundtrack of the protests. As you can see from the photo, they don't look quite the same as you may remember - a tall willowy blond with long flowing hair and bangs, bookended by tall darkhaired men with goatees. Yes, they're older, and yes they're sitting, and yes (what you may not be able to discern in the photo) Mary Travers is on oxygen. In '04 Mary was diagnosed with leukemia, since then has had a bone marrow transplant, and though fortunate to be alive has suffered damage to her lungs, thus the oxygen. And at 73, still has the gumption and guts to perform. OK, she is no longer has that iconic long blonde hair that flowed with every twist of her neck, but what she does have is readily apparent on songs like "If I Had A Hammer", where her voice just shines. It was great to see them, and great to see how they were able to still work together and perform so well, given challenges that might easily prevent most people from going on the road at all. So we got to hear, "Puff The Magic Dragon", "Leavin' On A Jet Plane", "If I Had A Hammer", "Where Have All The Flowers Gone" and two and a half hours of other stuff, and I got to sing "This Land Is Your Land" with them (well, actually me and about 2,500 other people). It was really bittersweet to see them, all now in their 70's, Mary struggling with her health - if you can find a way, see them soon. When I was a kid, and even a young adult, I had certain expectations of what would happen in the world. This year I’m going to be 60 . . .and I’m thinking about those expectations, and realize some have happened, in some cases way beyond my imagination. . . and some have not, and may not. Are you surprised or disappointed by “the future”? We caught them last night at Princeton. 2 1/2 hours of thematic improv. Lovett did a song, then they talked a little and Hiatt did a song related to some theme he picked up from Lovett's song, and so on for a couple hours. While I guess he's really known as more of a songwirter, the power of Hiatt's blues is amazing (and you gotta love anybody who can pull off the "how how how how" without sounding phony). And Lyle Lovett - well what can I say? Every time I've seen him I've been struck by the uniqueness and clarity of his vocals, and the subtle insight of his songs. These two guys seem to tour together sort of regularly (we saw them with Joe Ely & Guy Clark in '04 and '05). A really entertaining show if you're interested in songwriters and some insight into the songs and the creative process. I just learned Robert Hazard passed away last month. An unbelievably talented Philadelphia area singer/songwriter/performer - most widely know for having written Cyndi Lauper's "Girls Just Want To Have Fun". What was so strange was - if you were ever fortunate enough to have caught Robert in concert you would have said . . . "Nah, this can't be the guy who wrote the Cyndi Lauper song" (not that there's anything wrong with the song). He was an unbelievably talented writer and performer - a talent on the order of a Springsteen, Dylan or Simon. We caught him a few times in the 80s playing bars at the Jersey Shore in the winter time (very strange). In places where you'd expect to hear a "bar band" - and instead were treated to an unforgettable concert of original music that you'd expect to hear at Madison Square Garden, not a local bar. Last winter I was invited to a coffee shop in the Village where Rykodisc had arranged for Robert to play a set to kick off the release of his new album. I couldn't make it, I was ill; I'm sorry now that I didn't go anyway. A huge talent gone. But I'll never forget his live performances of "Escalator of Life", "Change Reaction", and how he finished every concert with a hard drivin' electric version of "Blowin' In The Wind". Every once in a while (a long while) this feeling comes over me and I realize it doesn't get better than this. Today at about an hour before sundown Joe Cocker took the stage at the Garden State Arts Center (outdoor venue, covered). About a half hour after sunset, it was still more than 90 degrees with a gentle breeze . . . . . and Joe broke into "With A Little Help From My Friends". By the second verse I had tears in my eyes and was thinking - - this is as good as the performance I missed at Woodstock. And about halfway through the song, and you know the spot if you've heard him perform the song, he lets loose a primal scream that is so powerful - so much more powerful than you can imagine, even if you've ever heard it on CD or DVD and think you know - so powerful it feels like he's unleashed a bolt of lightning and it's hit you in the chest. At that point I thought, "It just doesn't get better than this". Occasionally I get that feeling. Rare, but real. And after Joe Cocker, the Steve Miller Band took the stage and played for nearly 2 hours. All their great hits (and it's easy to forget just how many great songs Steve Miller did in the last 40 years), and some new stuff that was good. I hate to say it though - as good as the Steve Miller Band were, and they were very good - after hearing Joe Cocker they were just anti-climactic. Why exactly Joe Cocker is opening for Steve Miller I can't say - but if their tour is coming near you, you're in for a great 3+ hours of music. Just listened to “Preludes”, the new release of Warren Zevon work that was culled from a stash of tapes found by his son Jordan, who decided to release some of the cuts. The disc was very melodic and pleasant, and an absolute pleasure, however, none of Zevon’s albums over which he had artistic control were ever so calm and relaxing – while there were always some melodic and beautifully constructed songs, there were also edgy, driving, sometimes disconcerting numbers that could tie your stomach in knots or make your skin crawl. So while this exhibits even more fine work by an artist who I love, I have to wonder of the right (and I mean moral and ethical, not legal) of anyone to posthumously release the work of an artist, when the artist had clearly decided to not release that very work themselves? ps. I know this is no different than a 300 year old “unfinished” symphony or ballet, or unfinished canvas, but I question those too. I’m watching/listening to a Jonn Fogerty DVD, The Long Road Home, a 2006 concert. Fogerty at age 60 or so is as energetic, and has as strong and clear a voice as he has anytime in his life which, of course, makes me think about the difference in guys like Fogerty and McCartney, who seem to have a strength and freshness about them, and guys like Mick, Keith, Charlie Watt who seem to be pumped full of embalming fluid. So how come Fogerty can seem fresh and inspired doing “Proud Mary” 40 years later - clearly he’s done the number so many times that it’s hard to believe he’s really that enthusiastic, it must be an act, a performance . . . . or is it? He actually may be more animated and enthusiastic than he was 35 years ago. Well, maybe Mick and the boys, and others like them, never were very enthusiastic to start with. . . . .not so, I saw Mick, actually stood next to the stage in 1966 when he and his mates were 23 years old, and I’ll tell you, there was a time that they had passion, real passion. It may be more obvious in artists and performers whose lives and/or work are on display for all to see, but this ability to get through life, through decade after decade, and maintain a passion for life (or not maintain it) seems to vary greatly among people. How is it some people have the capacity to to be energetic, fresh and positive and others, who are in no worse physical condition, seem old, tired, disinterested? Passionate or apathetic? How do you keep passion alive, year after year? Is it developing new interests, refining old interests, living healthy to feel good? How do you prevent, avoid becoming apathetic? Is it the company you keep? What are the things that make a difference? Are they within our control?